Dignity Village's scheduled move to inner-city Portland was reversed on October 28, when Lee Larson, local businessman and philanthropist, donated $20,000 to the city for a six-month extension, allowing the village to remain in place throughout the winter. Larson, now retired, was not always well-off. He earned his money in the school bus industry, and along with his family, created The Larson Legacy Foundation, the charitable organization that decided to help Dignity Village out of their site selection predicament. Larson said, "What I admire about Dignity Village is not that it is a model tent city, but that they are inventing a community. They have security, they are innovative, they are friendly. They move forward in ways few people imagine these days." After three days of talks in late October, Larson agreed to reimburse the city so the camp would not need to vacate the premises by a November 1 deadline. John Hubbird, Site Selection Committee Coordinator, explained, "There were three separate meetings on three consecutive nights with three different outcomes. Psychologists tell us that moving is one of the most traumatic experiences people face, and to get up for it then get let down was very discouraging." During the three tense days near the deadline, phone calls were flying as residents packed their tents to comply with city orders. 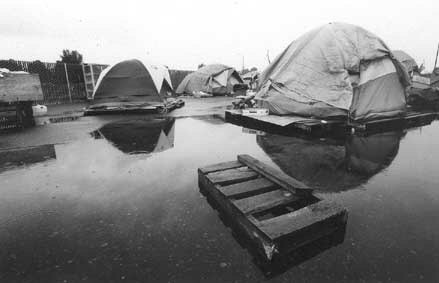 A new location at 31st and Powell had been found and half the camp had already been packed for the trip when Portland city officials, Larson and Dignity residents finally forged the solution. The final ballot in favor of staying at the airport site was a cliffhanger, passing by four votes. "It's good for us to be out here for the long run. Since it is somewhat isolated, there are less distractions while we set up our infrastructure. We're learning how to work together," said Dog Dave, a five-month resident. Says Erik Sten, Portland City Commissioner, "I'm very pleased with all that's happened. Dignity Village has turned a bad situation into a positive and important new model. The six-month extension will allow Dignity Village to focus on a permanent site and making the model really work. With some stability, we hope to see this turn into an alternative solution that helps people move into permanent and stable housing." In a follow-up donation, Larson provided a small bus to the site. While it cannot be used as a shuttle until insurance issues are settled, it is fitted with a television and video player for entertainment. "None of this would have been possible without the generosity and compassion of Lee Larson. This is a story of people doing for each other rather than accepting the roles that society gives them," added Sten. The half year extension is a mixed blessing. While it gives the City-approved pilot project a semi-permanent home, the location is far from satisfactory. It is approximately a 45-minute bus for villagers who need to access downtown servicesdowntown services. "You have to take a plane, train and a submarine just to get anywhere," said Gene, 48, a robust village resident. The shortcomings of the site do not prevent village residents from appreciating their camp, and they shine a bright light on the generosity of certain Portland individuals willing to step forward to help others. As Dignity Village approaches its one-year anniversary on December 16, the 65 residents are buttoning up over 40 tents and bracing for winter. Upbeat about the future, Dog Dave comments, "A lot of people are accepting that Dignity Village is a permanent part of Portland. We may not be at this location forever, but we will be part of Portland."